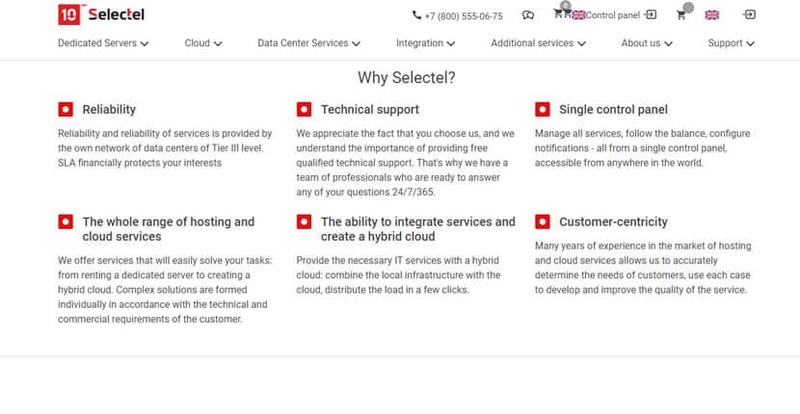 Selectel Review 2019: Is Selectel a Good Hosting? Selectel is a Russian company with a wide range of cloud and dedicated server solutions tailored for both individuals and businesses. The company provides high quality services for low prices compared to their competitors. Selectel is a Russian IT giant with over ten years of experience in the IT industry. The company operates out of six Tier III data centers located across the Russian Federation, which enables them to deliver comprehensive and stable services to more than 15,000 clients. They provide a wide range of cloud services and dedicated servers, along with other network services and custom solutions. Selectel’s website is available in both English and Russian. Out of all their plans and services, I was most pleased with their Vscale cloud server solution, which would work well for both individuals and businesses. There are several packages included in this service, each with an industry-leading 99.98% uptime, unlimited traffic, SSD storage, and dedicated bandwidth of 1Gbps. Every plan allows you to scale your resources up at any time, so if you’re expecting a traffic surge for a certain period, you can rest assured that there’ll definitely be resources reserved for you. Another benefit of their Vscale cloud servers is the one-click installation of large number of operating systems, as well as popular third-party apps such as WordPress. Selectel also offers scalable private cloud packages. These essentially function as your own virtual data center – except that you won’t need to hire a team of dedicated tech personnel just to maintain the servers. The plans are fully customizable: you can choose the resources and features you require and freely distribute them across however many websites you’d like to host. Best of all, they’re user-friendly and don’t require a lot of technical knowledge for you to get your own server set up. Selectel offers competitive prices; in fact, one of the key benefits of their cloud infrastructure is that for only a few dollars you’re able to secure loads of resources and value-added features. They accept several payment methods, such as PayPal, Qiwi Wallet, OKPay, credit card, or bank transfer. However, do note that these payment methods are simply used to add credit to your account; thereafter, the company deducts the credit from your account according to whatever pricing scheme you’ve chosen. With Selectel, you can choose either a monthly billing cycle or a pay-as-you-go hourly pricing model. One important note is that you will be charged even if your server is offline, because the company charges for the resources and servers they’ve reserved for you rather than for the periods that your server is online. In terms of support, Selectel really goes all out to help their clients. They offer a bilingual live chat with real people ready to assist you at any time. In addition, they have a phone number you can call at any time and a ticket support system that’s accessible via your client portal. Alternatively, you can check out their extensive knowledge base or their blog, which contain quite a number of interesting and helpful articles. Selectel offers a comprehensive suite of hosting services to individuals and organizations at competitive rates. They have a number of data centers ensuring optimal server performance for their customer base; however, the fact that all of their data centers are based in Russia indicates that their solutions are best-suited to European clients. Wondering how Selectel stacks up against other Web Hosting companies? Enter any other Web Hosting company and we will give you a side-by-side comparison.